When Michael Bucy ’01 founded UNC Dance Marathon in 1999 as a student, he hoped to alleviate some of the burdens for patients and families of UNC Children’s Hospital. Bucy’s vision was a 24-hour event in which participants dance through the night to raise money that goes toward providing emotional, medical and financial support. Seventy-five students participated and raised $40,000. Two decades later, hundreds of dancers took to the floor in Fetzer Gym on a March Friday and raised $434,139. Now known as Carolina For The Kids, the student-run organization has raised nearly $6 million over 20 years. Money raised through the event helps fund three program areas: the For The Kids Fund, which provides funding for things that insurance doesn’t normally cover, such as utility bills and gas cards; Parents’ Night Out, which provides a free, weekly hot meal for patients’ families to enjoy together; and grant money that’s given to the hospital for equipment and also to researchers who are working to improve the quality and success of care for the children. “It has become an institution at Chapel Hill, and I love how each group of students takes it, makes it their own, adds to it and makes it even better,” Bucy said. It is now the largest student-run fundraising organization in the state. Carolina For the Kids Executive Director Hannah Dix, a senior, said her passion for the organization comes from a love of service and the community that is fostered at Carolina. For The Kids Fund has provided assistance for 20,000 families. “When I think about helping families at UNC, I’m thinking about helping families that are also Tar Heels,” Dix said. “Everyone that walks through the door at UNC Children’s is a Tar Heel, and I think that that’s the Carolina way — to help them and do everything we can to make their experience in Chapel Hill as wonderful as so many of ours have been. “The thought of being there for them is something that keeps me and a lot of members of our organization excited and loving what they’re doing,” Dix said. Students participating in the Dance Marathon see their impact firsthand during the last two hours of the event when children and their families are invited to come out on the floor and share their stories. 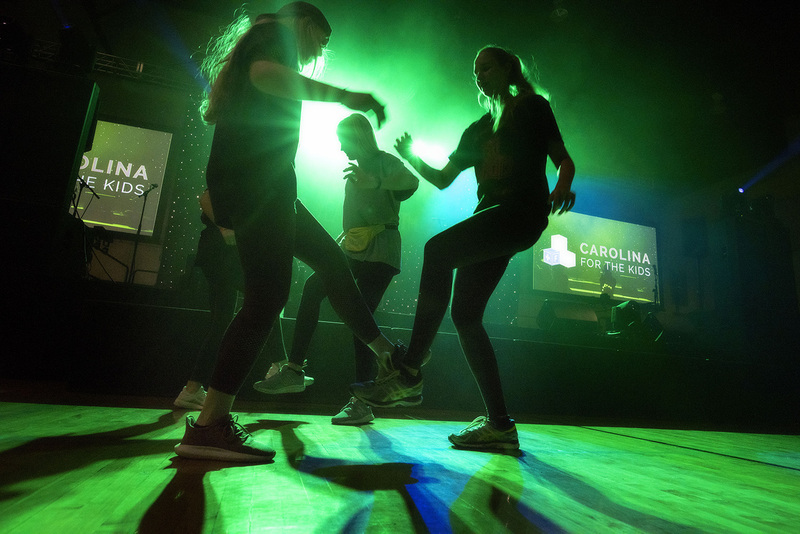 Despite the broad impact of the organization, Carolina For The Kids still emphasizes the fact that each dancer is making a difference for the patients and their families.